The first rule he broke was “Do Not Harass other Players.” Him and @HiPixels had two cities that were about 400 blocks away. 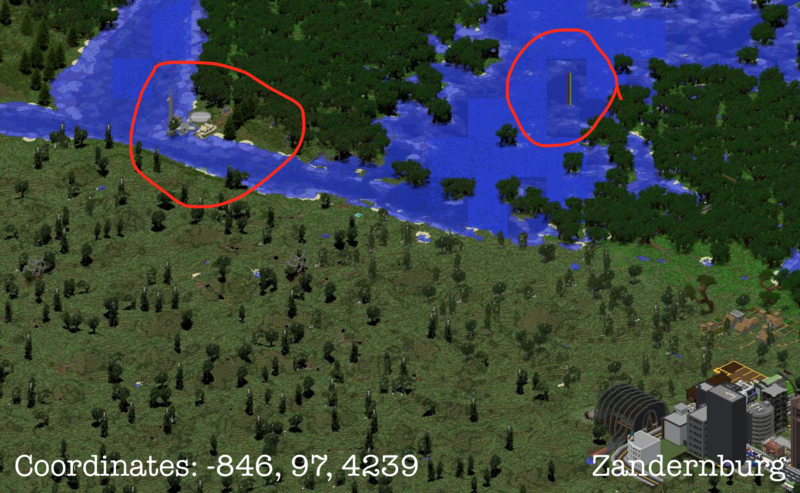 The second HiPixels started his city, pie went directly torwards him and made a railroad saying that the land was his, even though it was within 200 blocks of pixels’ city. I have screenshots here, the log blocks mark the 200 block border. It is important to note that he regularly spams excessively on the server, at least 3 times a day. 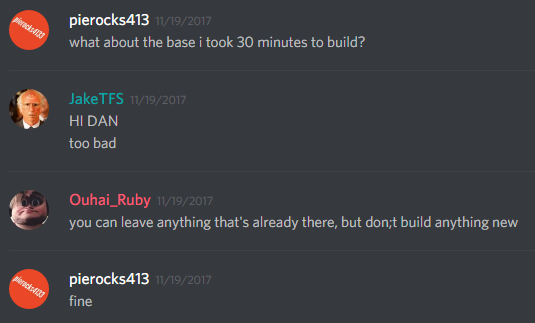 The second and third rules he broke was “Build out of sight from other towns, and No Claiming or Wars” I told pie at one point that Achilles was planning on making the mesa accross from it a desert, and then he said he was gonna claim it so they couldn’t. I even told him it was a stupid idea, but he still did it and even got in trouble for it. But he did the same thing again. 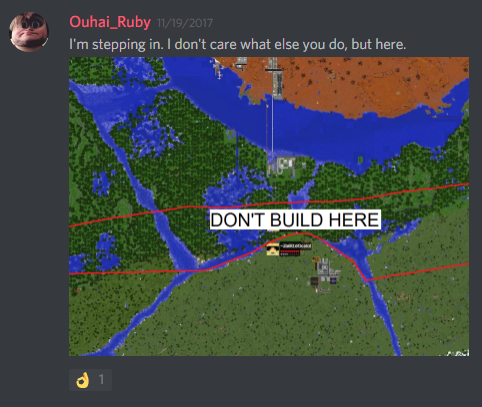 I have screenshots below of his “claim” very close to /warp TheValley and a small town I was making in no association with any country at all. NOTE: These are just the claims I’ve found, I expect there to be much more. Remember, @MrFerf said in his fourms post claims are not allowed. Here’s yet another one that stopped @A_Good_Shrimp 's city from being able to expand west, and @Cabal 's region to expand north. And I didn’t even need a staff to logblock this claim. Even after ferf posted about there specifically being NO WARS anymore, pie literally declared war hours after that thread was posted. And I’m about 90% sure he read that thread. The fourth and final rule he broke was “No Spamming on Fourms.” It’s very clear that pie is either trying to get his post count up or popularity increased, because he posts a lot of threads some days, and they’re not even in the right categories most of the time and have to be moved. They also are usually choppy and short, and either talk about him declaring war even though there’s now a rule against it, or his ever changing country, and whenever there’s a change, instead of editing his threads, he makes a new one. Staff, this is your decision, but I think a rule is being broke here. So in conclusion, I’m not sure what punishment pierocks deserves, but I am just so infuriated that he limits people from expanding their cities, spams in chat and fourms, and breaks rules every day and doesn’t seem to get punished (I may be wrong). Can we at least open up a staff discussion about this? I have had horrible experiences with pie. He has threatened me with nuclear weapons and he has popped multiple militaristic builds on our supposed border. It may be me or I am paranoid; he’s now trying to lock Zandernburg into a position where it can only expand East and West. He is making this X-Mas town which is suspiciously close. I want to contain all aggressions by pierocks4133 and solve as many of the issues in a civilised manner. He has tried declaring war on me. I will admit part fault because I technically instigated recent tensions. It happened when I proposed a forest that separated us as a ‘No Build Zone’ with any builds in the forest being untouched and still owned by its rightful owner. He never gave a solid yes or no, instead negotiating, making very unfair maps trying to give himself the largest advantage whilst attempting to hide it as well. NOTE: He had a LARGER advantage when I first proposed the treaty. It gave him more land in the forest and more waterways. After that he threatened me with missiles (as stated above) and then things had spiralled out of control. He had build military builds right next to Zandern plains. This was clearly a violation of my land because he had build IN it and I had all rights to it. It had gone exactly how I didn’t want it to go. To be honest I should have not built an artillery piece because I’m basically adding fuel to the fire, which is never a good thing. I decided afterwards, to try and solve it in a mature and civilised manner by removing my piece of artillery and requesting him to do the same and leave. Staff got involved and either Ouhai or MrFerf made a map which gave pierockes4133 an unfair advantage, giving him half the forest and locking Zandernburg from it’s true rightful land. Now, I have to be honest here AGAIN, KyleDriver technically violated the ‘No Build Zone’ that they set up. But that was because he never knew about it. It was only a small port than extended into the water a bit. We found a pole in the ‘No Build Zone’ that was made by pierocks4133. I think slimjim replied with a pole poking fun at his claim but I don’t exactly lnow who made the pole. After that incident, things went got ‘worse?’… He made a fort-y base with a piece of artillery, multiple guns and even a gosh darn tank! These are my experiences with pierocks4133. All military related claims are not protected by the 200 block rule and can be disregarded. This includes a turret or two, jets and tanks. 3. “Claiming” is not allowed, and is ever more not allowed when doing so with military builds. The only way in which you are able to claim land is by working actively on a project. Anything between an almost-complete city hall and New Vex City ensures a 200 block protected radius around the project unless you have been allowed by the owner of the project to build within that radius. [size=18pt]A single flag, tank, or hangar does not have the privilege of this protection. If what vex said is true, it is still very annoying to build things like that all over the map. He also broke 3 other rules, so that doesn’t make up for everything. Also, @A_Good_Shrimp gave me some pictures that are easier to interpret. This man has broken a No Build Zone SET BY A STAFF MEMBER and he procedes to annoy people and try to instigate tensions! @Ouhai_Ruby set the border, maybe I can get some input from them? The issue is currently being discussed by staff and we will notify you when we have made a decision. No problem hy, take your time reaching a verdict. What if you started a project in the “no build zone” would you just abandon the project? You would move it, the point of a no build zone is to not build there, if the project mattered that much, it can easily be moved. Pie will remain banned for the time being. If he decides to appeal, we’ll determine the absolute severity of the punishment at that time.